It was odd seeing John McCain without snark. I suspect his honorable, at times moving, and in some ways remarkable acceptance speech will be judged favorably by the public. It was a reminder of what he had once been as a politician ... and yet it did feel flat after the full-throttle bilge and vitriol of Sarah Palin and Rudy Giuliani the night before. It also seemed more a valedictory than an acceptance speech  more the end of a career than the beginning of a presidency. Why was it remarkable? Because John McCain is. "They broke me," he said flatly, of the torture he endured in the Hanoi Hilton. It wasn't the first time he'd said that  indeed, he has been more specific: he has admitted attempting suicide after the North Vietnamese twisted and yanked the war-crimes confession out of him  but it is bracing, all the same, to hear a politician admit weakness. Indeed, this was the first time I'd ever heard a presidential candidate admit his party's failure as comprehensively as McCain did tonight: "Instead of changing Washington, Washington changed us ... We lost. We lost your trust." This is yet another McCain gamble: he figures that the only way the country will elect a Republican after eight years of scandal and stupidity is to promise a completely different Republican Party. His essential message was right: Washington does have to catch up to the global economy, shake loose the bonds of the special interests and industrial-age bureaucracies. But there was little in this speech that indicated that he had any idea how to do that besides relying on his fierce sense of righteousness. And the Republican Party is what it is: an overwhelmingly Caucasian group of people  93% of the delegates were white  who cheer more vociferously for tax cuts than they do for country. Obama would "raise taxes," but McCain's own economic advisor Douglas Holtz-Eakin said last month that Obama's plan was a net tax cut for most Americans. Obama's health plan was a "government-run health-care system," which it isn't. It isn't even mandatory. And McCain's plan would actually increase taxes for some  a good idea, by the way, in a more comprehensive system  by limiting the deductibility of employer-provided health benefits. He said Obama opposed offshore drilling and nuclear power, after an audience of 40 million saw Obama say last week that he was open to both. Happily, McCain didn't repeat the canard that Obama wanted to lose the war in Iraq  and he kept his weapons sheathed on Iran (apparently his focus groups are saying the same thing most others are: people are tired of war, war, war ...). There were a few admirable ideas in the speech  an emphasis on school choice and limiting the power of the teachers unions; offering a form of wage insurance for those who lose high-paying factory jobs and have to take low-paying service jobs  but there weren't any new ones. McCain's energy plan sounded just like Obama's, without the closing of loopholes and tax breaks for big oil companies that Obama (and apparently Sarah Palin, who passed a windfall-profits tax) favors. But he failed to disarm Obama's most potent criticism: that he essentially favors the same policies  especially the economic policies  as George W. Bush. And it wasn't corruption that caused those policies to fail; it was the radical orthodoxy of the vision. In the end, the strongest aspect of the speech may have been the awkwardness of the delivery. 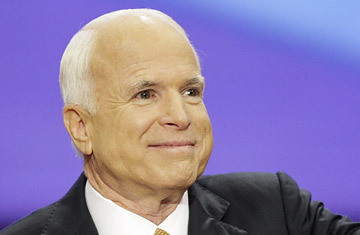 What we saw tonight was the real John McCain. But his offering was thin for a country in a heap of trouble. Given the admitted failure of his party, he didn't present anything more than his own integrity as an action plan. And given the anger and vitriol of his campaign  given the scurrilous, sarcastic speeches he allowed to be delivered on Wednesday night; given the embarrassing antics and media conspiracies spouted by his staff  McCain's reputation for integrity has been badly damaged.